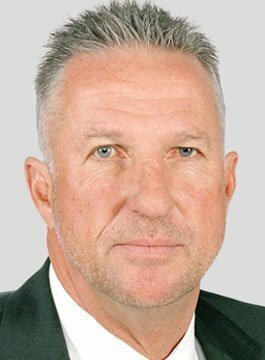 Sir Ian Botham is recognised as the best all-rounder that world cricket has ever seen. He started his career on the football and cricket fields simultaneously, with Scunthorpe United and Somerset County Cricket Club. Sir Ian career is littered with many outstanding achievements, however, his greatest performance was in Bombay in 1979/80 for England vs India when he hit 114 in his only innings and took 13 wickets in the match (6-58 and 7-48). This was the first time that the all round feat of a century and ten wickets in a match had been accomplished. Botham reached a career double of 1,000 runs and 100 wickets in his 21st Test match and his tally of 100 wickets was achieved in two years and nine days, another record. The youngest cricketer to take 200 wickets in a Tests, he reached his second double of 2,000 runs and 200 wickets after 42 Tests and was the first player to hit 5,000 runs and take 300 wickets in Tests. A back injury in 1988 threatened his career and, despite further injuries, his Test career continued until 1992. After a visit to Musgrave Park Hospital in Taunton, the battle against leukaemia became a subject close to Ian’s heart. Since then Ian has worked tirelessly to raise money for the Leukaemia Research Fund, having singlehandedly raised over £12m for the charity. Since his retirement from competitive cricket Ian has continued his involvement in the game through the role of cricket commentator for Sky Sports. Ian Botham was awarded the OBE for his services to cricket and charity in 1992.